Nine-year-old Laurini had just arrived at school when the mortar fell into the playground, the shrapnel tearing into her small body. Standing on the corner of a narrow alley of Damascus' Old City, her father, Isam Bachour, scrolled through the photographs on his iPad of his daughter in a wheelchair. Her white dress failed to cover the stubs of her legs, ending at the knee. "It was the early morning. She was about to enter the classroom when the shell landed," said Mr Bachour. "It killed one 10-year-old boy and injured Laurini and 40 others." Despite being in the heart of the Syrian capital, the Old City - a Unesco World Heritage site and stronghold of the country's Christians - is one of the last parts of government-held Damascus still afflicted by the civil war. 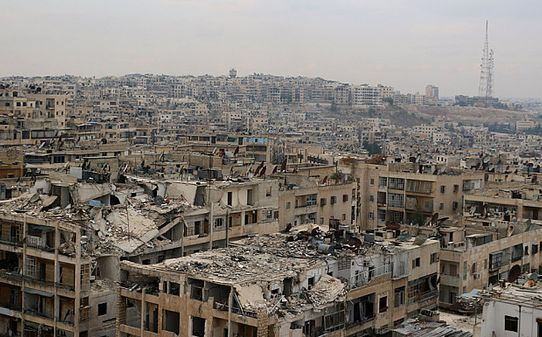 After nearly four years, a sort of calm has been restored to other quarters of the city, after the Syrian army bombardment largely emptied rebellious districts of their opposition fighters and civilian residents alike. But the ancient walls of the Old City continue to reverberate from the impact of falling shells. Just over a mile away lies Jobar, the most central rebel-held part of Damascus and a major frontline in the war. Syrian military planes roar over this ancient Damascene quarter, flying low as they lock on to their targets in the neighbouring district. Jobar is little more than a graveyard of blasted concrete: its buildings collapsed, or riddled with bullet holes. Its residents have mostly fled into eastern Ghouta, an opposition-held part of the suburbs that is also under siege. The Old City has been inhabited for more than 4,000 years, and today residents still try to go about their daily business. But they do so knowing that their lives are in constant danger. They were the targets of car and suicide bomb attacks in the early years of the war and mortars, artillery shells and bullets continue to fall. "It's a miracle that we are still alive," said Gabriel Daoud, the Syrian Orthodox Patriarch of Antioch, standing before his Saint George church. "Bombs fall day after day". It's unclear if the mortars are random fallout from nearby battles, or attacks from the rebels intended to hit this residential area. Many Christians see it as part of an offensive against their sect by jihadist groups. While Christians tried to remain neutral in the war, many have been kidnapped and churches have been desecrated by extremist members of the opposition. The cobbled thoroughfare that runs from "Straight", an alley noted in the Bible, to Bab Touma (the Gate of St Thomas), is the address of both churches and mosques. It is bursting with stalls of juice sellers, watchmakers, mechanics, shoe vendors, jewellers and painters, and comprises residents who are Christian, Muslim, Armenian, Shia and Druze. In a small cave that is home to a Syrian Orthodox shrine of St George, two elderly ladies in their seventies act as caretakers to gold trinkets, painted portraits and rock slabs carved with ancient scripture, just as they have done for decades. But fearful of being struck by a falling mortar shell, many residents have limited their movements to the bare minimum needed to survive. Eva Astefan, whose 14-year-old daughter Adel died after the bullet of a sniper hit their car as the family drove down a Damascus highway, now lives between her house in Bab Touma and the church less than 100 metres from her home. "I am a caretaker there. But the rest of the time I live at home," said said. "I don't allow my family to go out. My 23-year-old son, George, was meant to start at Damascus university, but I won't let him ... I am afraid something will happen." She spoke sitting on the sofa in a small open-roofed courtyard in the centre of her home. Her windows were criss-crossed with tape to stop glass spraying in a blast. The sound of nearby explosions interrupted the peace every few minutes. "Bullets fall in here in the courtyard sometimes," she said pointing to a tarpaulin overhead that was riddled with holes. Mr Bachour, the Christian nine-year-old Laurini's father, said he too had tried to safeguard his family: "We had kept our children in the house for days as we feared that something was going to happen. But Laurini's first communion was coming up. That day at the school they were getting the white dresses for the ceremony, so we decided to take her." Mr Bachour said he had moved his family to neighbouring Lebanon after the attack, but that he returned to Damascus for his work. They hadn't wanted to leave Bab Touma, he said, adding that Christians needed to stand their ground, and remain to defend their heritage. But in the circumstances he didn't have a choice. "Laurini remembers the bomb falling and seeing it kill and hurt her friends. She was in the courtyard covered in blood too wounded to move. She shakes if she hears a bomb now."